Pakistan is a country with massive population of over 180 million but only a small percentage of its population has access to the Internet. recently a new service has been Introduced in Pakistan by Facebook in collaboration with the Telenor which provides basic Internet services for free in Pakistan. 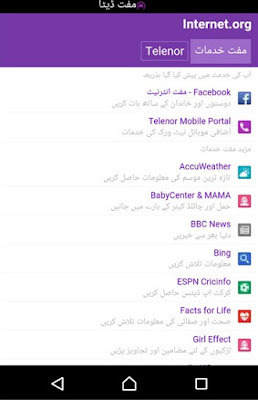 You just need to have a Telenor SIM in your Mobile Phone and then you will visit Internet.org where you can access 20 websites of different types Including Facebook for free. BBC News, ESPN Cricinfo, IlmkiDunya, olx and Wikipedia are also Included in the list which you can surf for free. to use these service you need to open Internet.org from your Mobile's web browser. If you are using a smartphone you can also download Internet.org to avail this free amazing service. this is a really good news for those people who want to use Internet but cannot afford it. Telenor has also announced that soon they will Include more websites to the list which can be accessed for free.